Unofficially named Bearpaw Peak lies at the head of the Royce Lakes basin very near the Sierra crest, rising above 12,900ft in the heart of the John Muir Wilderness. Our starting point was the Pine Creek TH west of Bishop, one we've used for the Sierra Challenge in a number of previous years. Having been a bit surprised by the amount of snow still lingering at the higher elevations on the first day, most of us came prepared with ice axes and crampons today. There were more than 15 folks at the TH for the 6a start, though not all were ready for the group shot we took before heading out. We spent the first hour and a half climbing 2,400ft in a little over 3.5mi, getting almost half the day's elevation gain out of the way as we climbed the switchbacks out of the impressive Pine Creek drainage. Pine Creek was as full as we'd ever seen it in August, a rush of brilliant white water cascading down from the high basin above. When we got to the creek crossing just below Pine Lake, we found the footbridge under several inches of rushing water spilling over it. Most, but not all of us, took off our shoes to make the crossing, a bit unnerving, but thankfully there was good traction on the log's surface and we all made it across without incident. A second crossing a mile and a half later at the inlet of Upper Pine Lake was also under water, this one a long stretch across boulders strategically placed to facilitate the effort. Once again the shoes came off (or not, depending on preference) and we went across barefoot. Unlike the first crossing, the mosquitoes here were ferocious and nearly drove me crazy trying to get my boots and socks back on without getting mauled. Once this was accomplished I got moving in a hurry to leave the pests to bother the others still lingering at the waters' edge. By the time I got to the Honeymoon Lake junction around 8:30a I was left in the company of just Michael and Jim P, others having gotten well ahead and still more somewhere behind. There are two primary options for reaching Royce Lakes, one leaves the trail soon after passing Honeymoon Lake while the other continues up further into Granite Park towards Italy Pass before turning left to climb to a saddle east of Bearpaw Peak. I hadn't really decided which way to go and sort of just followed Michael as he turned off for the first effort. Traveling just ahead of us out of earshot was Jim who quite suddenly found himself alone and probably wondering what became of us. Hiking through the thin forest and small alpine meadows, we soon climbed above treeline and came across the first of several snowfields we'd encounter this morning, this one on the northeast side of the pass between Treasure BM and Spire Peak. We spotted a few others ahead of us taking a break at the start of the snow, Jim soon showing up just behind us, having also turned off for the first option after discovering us missing. I stopped to put on crampons while Michael continued up the snow without them. At the pass where Royce and Feather Peaks rise up before us, we found yet more snow, with the Royce Lakes still mostly frozen over. 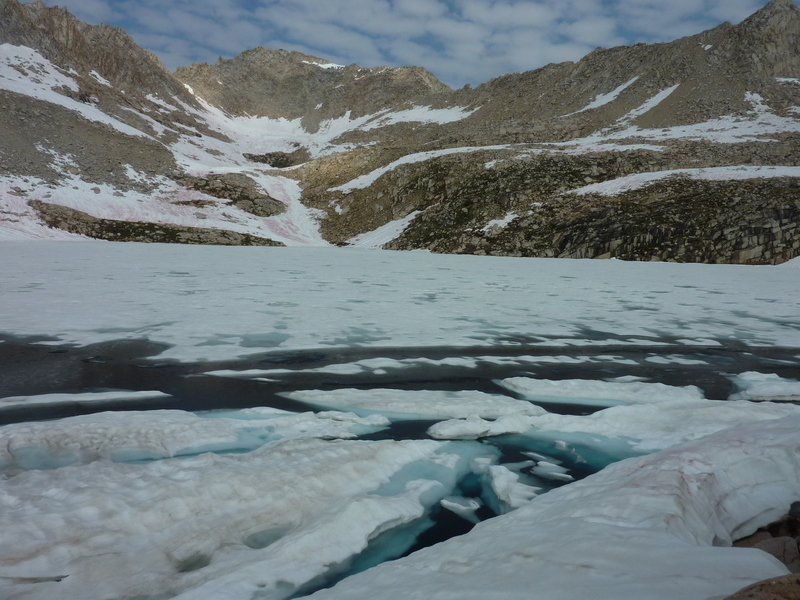 We climbed up to a shallow saddle between the uppermost of the lakes for our first view of Bearpaw Peak less than a mile to the WNW. There was a steep snowbank that needed to be descended to the highest of the lakes, and it was here that the crampons were most useful. Not far behind us, Sara had been one of those without crampons or axe and she would be unable to continue safely past this point. Ahead of us, we expected to see Robert, Zach and Tom making their way up towards the peak, but they were nowhere to be seen. I decided to go across the last of the frozen lakes as a shortcut while Michael thought it better to go around the northern shore. Jim looked both ways and decided to follow me across the lake. I'd been across a few frozen lakes before and didn't think this one too concerning, but I did probe the upper snow layer with my axe in a few places just to be sure. After we'd started up the snow slopes on Bearpaw's east side, we spotted Robert and the others high above us to the right, heading towards the NE Ridge. That seemed a slower proposition than staying lower on the East Slopes since it involves some class 3 scrambling up, down and around a variety of obstacles along the ridge. This proved to be true as I found myself catching up to Robert just below the summit where our routes converged just before 11a. There were three points vying for the highpoint honors, the westernmost one proving to be the highest. It had a class 3/4 summit block that could hold two or three people and we took turns climbing it as we waited for others to join us. Within about 15min we had seven folks at the summit for a group photo under skies that were growing increasingly threatening and made for mediocre views. It was clear that we hadn't taken the most efficient way up the mountain, leading most of us to choose a more direct route directly down the ESE side to the lake. From there we could more easily go around the south shoreline to return the saddle where we'd first sighted Bearpaw Peak. This time, Robert chose to explore the edges of the partially frozen lake and for his trouble ended up with a soaked boot when the surface unexpectedly softened on him - probably a good place to have been probing with his ice axe. Five of us continued down the snow and forest into Granite Park to Honeymoon Lake, and eventually back to the upper creek crossing. Here Zach went zipping across the rocks still under 2-3 inches of water, not bothering to remove his shoes. He was on a mission to get the stage win and would beat the rest of us back. Robert did likewise, figuring one boot was already soaked anyway. Not quite in the same rush as Zach, he would finish five minutes behind him. Michael, Jim and I, meanwhile, took the time to take off our boots to keep them dry before crossing. Jim started across after Michael and I had reached the other side, and losing his balance between rocks, flipped backwards into the creek, the shoes he was carrying getting flung out into the flowing water. It was a comical sight to see him chase down his shoes while barefoot, Michael and I too far away to offer any real assistance other than to document his travails with a few photos. He took it in very good spirits with a smile, glad they hadn't gone another 30yds further where they might have been carried out into faster waters. We spent the next hour and three quarters descending the rest of the trail back to the start, and despite the wet shoes, Jim still managed to beat Michael and I back to the TH. For our part, Michael and I were glad the other wasn't running back down, else we'd feel obliged to follow in kind. With his long legs and fast gait, I still ended up jogging occasionally just to keep up with Michael. We got back not long before 3p to finish the day with plenty of daylight remaining. After two days, Robert Wu had a 50min lead for the Yellow Jersey over Michael and I, who in turn were tied for the Green Jersey (over 50yrs). With almost no competition, Zach Moon easily had the lead for the White Jersey (under 25yrs). With another strong outing, this one going 18hrs to cover 28mi, 9,000ft of gain and six bonus peaks, Scott Barnes had already amassed a total of 15 peaks which put him far out in from of the lead for the King of Mountain (or Polka Dot) Jersey - the next closest participant had but four peaks.